Flatbed towing leaves your car or truck in place and generally doesn’t require any additional safety features or straps. However, we still tie it down for added safety, especially for a long haul tow. Flatbed towing is also when towing heavier vehicles. For medium duty and smaller heavy duty vehicles, we may still opt to use the flatbed tow truck to safely and easily haul it to wherever y​ou need it. 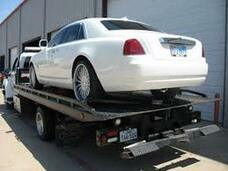 Flatbed tow trucks are what is generally used in car accidents. This not only helps protect the tow truck driver from becoming injured from broken class or jagged metal surfaces, it also helps contain the damaged vehicle without risking further damage. Lighter vehicles generally get a dolly truck used for their towing needs. This method leaves a couple of tires on the ground. Light duty towing is categorized with Class 1 and Class 2 vehicles. The majority of the vehicles on the road fall into this Light Duty category, which typically includes cars, SUVs, pick up trucks, and minivans. If your vehicle is for personal use, it is more than likely a light duty vehicle. Our light duty tow trucks can pull you off the freeway, out of the traffic, out the ditch or whatever your needs are. Medium Duty towing includes Class 3 through Class 6 vehicles. Theses are mostly box vans, delivery trucks, RVs and motor homes and most large work trucks. 3 through 6. Essentially most delivery trucks or box vans as well as refrigerated box trucks for your business. As well RV's or motor homes are usually within this category. Many large work trucks or utility vehicles are included also. We like to think of it as just above the everyday vehicle, likely for business purposes but not always. Our medium duty tow trucks will help you get your truck or work vehicle to the shop quick. We can even recommend a repair shop if you need it. 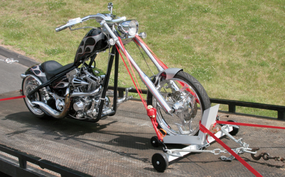 Many towing companies don’t have the right equipment to safely transport a motorcycle. We have the right equipment and we can transport your motorcycle to the shop, to the show, or where you need it. When you to move your bike, call us for dependable motorcycle towing in Tempe. We have experienced tow truck operators who have towed vehicles from the Tempe and Phoenix area to Tucson, San Diego, Las Angeles, Las Vegas, Flagstaff, and more. We tow cars and trucks from Arizona to California or Nevada and vice versa all the time. You can trust 202 Towing with your exotic car or other long distance towing needs. We can tow your RV in and around the Tempe and Phoenix area or we can tow it long distance. Give us a call for a quote. I'm sure almost everyone has done this has at least once. Or twice. Uh, with the keys in the ignition? No, surely not. But, if that's why you are calling, don't worry. We can get there fast and help you out. And, we won't tell anybody. If you have a flat tire and are not able to repair it, or don't want to because it is just too dang hot outside to do it yourself, give us a call and we'll fix it for you. If it's not fixable, we can haul you in to the repair shop or tire shop and help you get back on the road. If your battery is dead and you need a jump start, give us a call 24/7. We'll bring the jumper cables and get you back on the road. If it won't start, we'll tow your vehicle safely to the destination of your choice. Tempe Towing Services provides emergency roadside assistance when you need it most. If you car is broke down or if you've been in a fender-bender and you need a tow, give us a call. We are open all day, every day. Drivers are always on call, 24 hours a day, 7 days a week. Unwanted vehicles sometimes just appear out of nowhere. They are left behind when they quit working or by former tenants. We can help you remove these vehicles from your business, apartment community, retail center, etc.